We’ve got a new job opening in the NYS IPM Program for a NEWA Coordinator, Extension Associate! The New York State Integrated Pest Management Program (NYSIPM) is a nationally recognized leader in the development and promotion of IPM practices. The NEWA Coordinator will facilitate and guide the Network for Environment and Weather Applications (NEWA) http://newa.cornell.edu/, its operation and development across agricultural commodity areas, and collaborate with NYSIPM staff, the Northeast Regional Climate Center (NRCC), and other Cornell University faculty and Cornell Cooperative Extension specialists to maintain, expand, and improve NEWA. S/he will facilitate and lead statewide and regional demonstration, implementation, and research activities of NEWA and promote is use in IPM decision making. Coordinate the development of NEWA tools with faculty and researchers. Coordinate implementation of tools and applications that use weather data for IPM and crop management. Develop and coordinate state NEWA expansion networks and individual partners in non-member states. Interact with NRCC programmers to create NEWA tools. Provide leadership for planning, implementing and evaluating NEWA educational programs that address producer and IPM practitioner-identified needs and opportunities. Lead and cooperate on NEWA grant and funding proposals with agencies, organizations, faculty and extension personnel, that will address IPM applied research needs and generate program support to enhance and extend program opportunities. Plan and execute NEWA demonstrations, workshops and webinars. Develop educational materials in support of NEWA, such as manuals, fact sheets, videos, websites, decision support tools, mobile applications, etc. Facilitate adoption of NEWA tools. Provide technical guidance and educational support on NEWA for extension off-campus staff, especially Area IPM Extension Educators whose audiences may benefit from NEWA tools. Work cooperatively with Agricultural IPM program staff in the development of applications. Work cooperatively with Community IPM program staff in the development of applications, particularly as needs may overlap in the landscape and turf management arenas. Knowledge of the philosophy and practice of IPM. Ability to initiate, plan, conduct and evaluate informal adult education programs. Ability to communicate effectively: verbally, written, and multi-media. Ability to communicate effectively with programmers. Ability to lead and participate in teams. Education – MS (required) or PhD (preferred) degree in Entomology, Plant Pathology, Weed Science, Horticulture, Environmental Science or Atmospheric Science. Experience – Minimum of 2 years professional experience in Extension education and/or research in IPM. Graduate student experience may be applicable. Application, Submit by August 31, 2016: Curriculum vitae, letter of interest, names and contact information for three references, and a one page statement about your philosophy of IPM and effective ways of promoting and evaluating IPM implementation. Apply at https://academicjobsonline.org/ajo/Cornell/NYSIPM. Start Date: October 1, 2016, or when a suitable candidate is identified. Location: New York State Agricultural Experiment Station, Geneva, New York. NYSIPM is a nationally recognized leader in the development and promotion of IPM practices. http://nysipm.cornell.edu/. The mission of NYSIPM is to develop sustainable ways to manage disease, insect, weed, and wildlife pests; and to help people use methods that minimize environmental, health, and economic risks. NYS IPM has both Agricultural and Community programs, with issues and settings that overlap. NYSIPM’s Agricultural IPM programming includes fruits, vegetables, ornamentals, and livestock and field crops. Community IPM is the management of insects, weeds, plant diseases and wildlife in all settings that are non-production such as schools, lawns, gardens, landscapes, golf courses, parks, and buildings; and also includes invasive species and public health pests. The personnel of NYS IPM operate in a collegial and cooperative environment where teamwork is emphasized and appreciated. Collaboration with other NYS IPM faculty and staff, Cornell University faculty and staff, and Cornell Cooperative Extension Educators, as well as specialists from other states and universities, is expected. Education and Experience – All applicants must have an MS (required) or PhD (preferred) degree in Entomology, Plant Pathology, Horticulture or other suitable field. A minimum of 2 years professional experience in extension education and research or demonstration in required for Extension Associates, 8 years for a Senior Extension Associate. Experience in these areas as a graduate student may apply. Additional Information AND HOW TO APPLY – For additional information and application instructions go to https://academicjobsonline.org/ajo/Cornell/NYSIPM. Applications will be accepted until 8/31/2016, or until a suitable candidate is found. This entry was posted in news on July 27, 2016 by jec3@cornell.edu. 14, 2016 showed 23% of the Northeast in a drought. Drought Advisory’s and Drought Watch’s have been declared, and voluntary and mandatory water restrictions have been implemented in the region. The current drought is expected to be seasonal and is focused in three main areas. Drought conditions have occurred in Essex County, MA seven of the past 17 years, with a drought every year since 2012. Tompkins County, NY, is experiencing a severe drought for the first time since the U.S. Drought Monitor began in 2000. Bergen County, NJ has experienced drought conditions nine of the past 17 years, with extreme drought in 2002. Large areas of New York, Vermont, New Hampshire, New Jersey, and Pennsylvania have had less than three quarters of their normal March through June precipitation amounts. 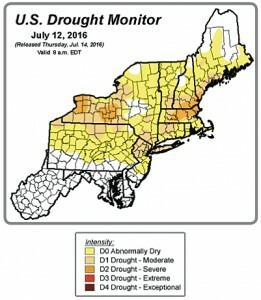 The U.S. Geological Survey (USGS) preliminary data showed waterways in parts of New England, New York, Pennsylvania, and northern New Jersey were running below or well below normal levels in late June and early July. early July showed topsoil moisture rated short or very short for 51% of New York and 60% of New England, while subsoil moisture rated short or very short for 47% of New York and 56% of New England. Many farms need irrigation to prevent the dry conditions from hindering growth, stressing crops, and reducing yield. For example, pastures were stunted and corn was curling in parts of central New York. Several farms in northeastern Massachusetts reported crop losses due to non-irrigated fields being too dry to plant or seeds not emerging after planting. The Climate Prediction Center’s Monthly Drought Outlook for July calls for drought conditions to persist or develop in parts of the Northeast. NEWA products and linked resources are available to assist in decision making during these conditions. Cornell Apple ET Model, an app for managing irrigation in apple orchards. Apple Evapotranspiration Table, an estimate of water use by an apple tree (liters/day) for airport locations in NY. Evapotranspiration Map from ForeCast and the Northeast Regional Climate Center (NRCC), an estimate of potential evapotranspiration (PET) in turfgrass. Drought Monitoring, from NOAA – the Palmer Drought Index, provides access to several drought monitoring products and historical records. U.S. Drought Monitor Map, the map is based on measurements of climatic, hydrologic and soil conditions as well as reported impacts and observations from more than 350 contributors around the country. U.S. Drought Outlook Map, depicts current large-scale trends of drought based on statistical and dynamical forecasts. This post was contributed by Jessica Spaccio, Climatologist, Northeast Regional Climate Center and Dept of Earth and Atmospheric Sciences, Cornell University, jlr98@cornell.edu. This entry was posted in about models, information, news on July 18, 2016 by jec3@cornell.edu.